Cheese? Japanese food? Get them both with our new Cheese Specials, every bite will definitely leave a smile on your face! 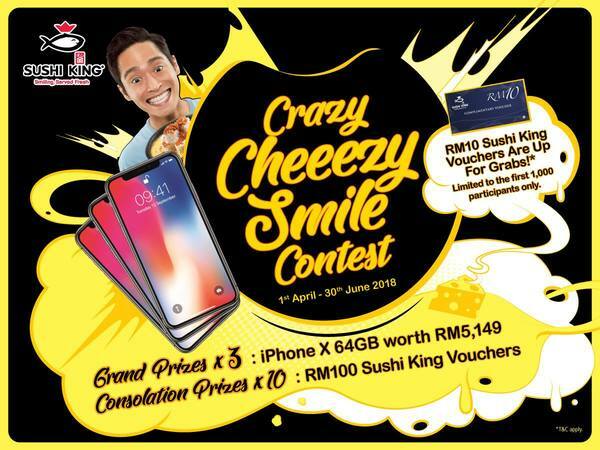 Come give it a try and you could win an iPhone X or Sushi King vouchers in the "Crazy Cheeezy Smile" contest. 1. Order one of the Cheesy Specials. 2. Snap a creative selfie of yourself smiling while enjoying the Cheesy Specials. 3. Upload the picture to the contest’s Facebook comment box. 4. Each entry will be awarded a RM10 Sushi King Voucher. Limited to the first 1,000 participants only. 5. At the end of the contest period, the total number of entries will be divided according to algorithm to derive the winning entries for the Grand Prizes and Consolation Prizes.